The second being the insert. 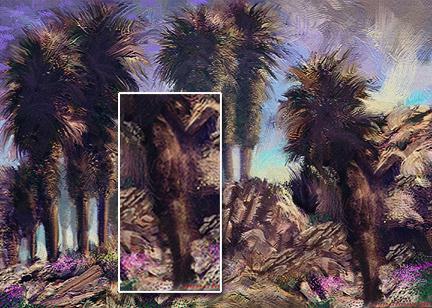 This digital painting was started two years ago, while I was living near the Cahwihia Indian Canyons near Palm Springs Ca. The Program that I painted it with was Photoshop. Its part of a project I started as "desert scapes" for lithographs. I finished this one early today and named it 1000 Palms. I liked it very much and stepped back to view it on a larger screen. When Idid, I noticed this figure on the right hand side. (The Palm Trunk to the right) I had to sit down and really look at this figure closer. All I know is that this is not a trick and I recall painting that area. But I don't ever recall thinking of anyone or thing at the time....Iam lost for words about it. Click here for another beautiful image created by Pronobis!